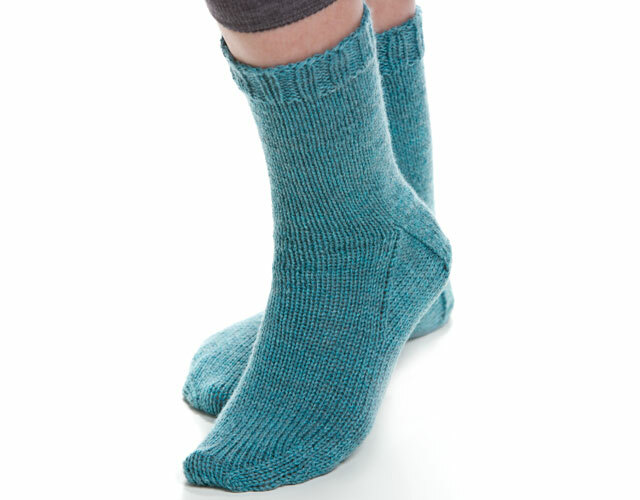 Keep your family's feet toasty warm with handknit socks! Learn 3 techniques on a classic sock pattern. Find out more in the Class Description below. This video was very helpful. I followed the instructor for my first sock, using the pattern provided. I just started a different sock pattern and went back to watch again when I got to the heel! Very much appreciated the ability to watch again and again! This is a great dvd for a new knitter learning on dpns. If you want to master the other methods, it is not as informative. I realize that I can rewind as many times as I need in order to master a technique, but the instructor flies through the Kitchener stitch and doesn't really explain it well. So on my project, the grafting of the toe looked funny and didn't turn out like hers. My only problem with the class was the toe part. This is a wonderful class! The instructor was very easy to follow. I found her style of teaching very frustrating. Each time she moved on to another step she didn't hold up her work to show where she just completed. She was too quick to continue knitting and not clearly review before moving forward. I had to keep rewinding with hope to catch a glimpse of where exactly she was, and kept hoping for a review before the next step. I watched more of her basic knitting than explaining. I had to continually rip my work especially when she was creating the gusset and doing the decreasing. I was hoping to find another instructor that offered sock knitting so I could switch but she seemed to be the only instructor.